You’ve heard of Topgrading®, right? The objective of Topgrading® is all about finding, acquiring, onboarding and keeping A-players. What is the Topgrading® equivalent of entrepreneur A-players? I don’t think there is one, but Entrepreneur Upskilling is top of mind. So what is it? Every CFO should be familiar with the great writing of Dr. Tom McKaskill. If you do a search on his name and include PDF in the text string, you’ll find numerous books scattered throughout cyberspace. Count me as one of his biggest fans. In his short book of entrepreneurial essays entitled Masterclass for Entrepreneurs on Fundamentals: Insights Into the World of the Entrepreneur, my favorite chapter his last one. It’s about entrepreneur upgrading. Hence, my mind’s first top-of-mind thought was Topgrading®. 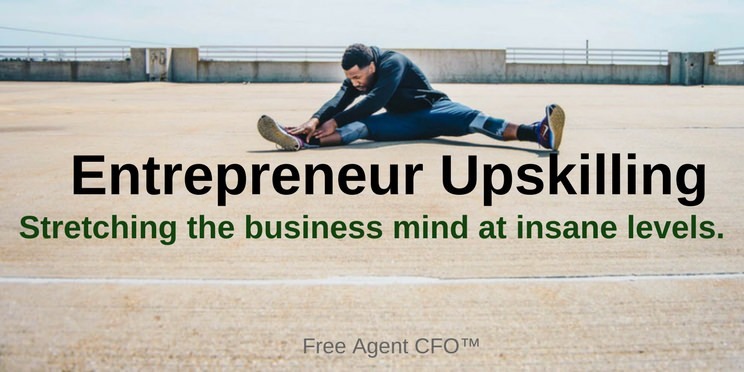 Entrepreneurs, like great athletes or great musicians, have an underlying talent for business. They are naturally creative when it comes to creating a business to enter a new market or bring a new product or service to market. McKaskill, Tom. Masterclass for Entrepreneurs on Fundamentals: Insights into the world of the entrepreneur (Kindle Locations 627-628). Breakthrough Publications. Kindle Edition. Every great athlete has a coach that helps them to optimize their capability through training in best practices, review, and feedback and exposing them to competition. McKaskill, Tom. Masterclass for Entrepreneurs on Fundamentals: Insights into the world of the entrepreneur (Kindle Locations 629-630). Breakthrough Publications. Kindle Edition. I agree with every single word. As CFOs, we need to make sure we’re acting on a some new (or old) verbs as we go about our daily consulting work. Many of you may already be doing this, but our work is not about doing, doing, and doing some more. It’s about educating, educating, and educating some more. Entrepreneur Upskilling is not a part of the commonly-used business lexicon. It’s time we change that. If you are a business owner, what are you currently doing in the area of employee upskilling? Some of you have started book clubs and added libraries with great business books. But you are in the minority, unfortunately. The rest of you have a great opportunity to grow employee engagement, enthusiasm, and energy by developing an employee upskilling initiative. What’s holding you back?